Cook noodles according to package except, rinse and drain just before they are fully cooked. Prepare Pad Thai ingredients . Mix sauce ingredients in a bowl. Heat a tablespoon of oil over medium high heat. Add the carrots and stir-fry for 2-3 minutes. Add the onion, zucchini, red pepper, and cabbage and stir-fry until tender-crisp—be careful not to overcook them. Turn the heat down to medium low, add the sauce and noodles. Stir constantly to insure all of the noodles are coated in sauce and are allowed to soak it in until they are fully cooked. Turn heat off and stir in the peanuts, green onions, and herbs. Serve immediately. Hummus makes a great snack or appetizer before a meal. The following recipe comes from my good friend, Julie Herbert. Yum! Place all ingredients into a high-powered blender and mix until smooth. Every once in a while we enjoy dining on Columbia River Salmon my husband catches on his trips to the Great Northwest. Try our version of "Spicy Salmon Sushi Bowl." Yum! In a medium bowl, whisk together the soy sauce, rice vinegar, sambal, sesame oil, toasted sesame seeds, and minced ginger. Add the flaked salmon. Stir to mix and set aside to marinate. When the rice is finished cooking, sprinkle with additional rice vinegar and stir to mix in. Scoop cooked rice into each of two bowls. Top each with half of the spicy salmon and spoon on any extra sauce. 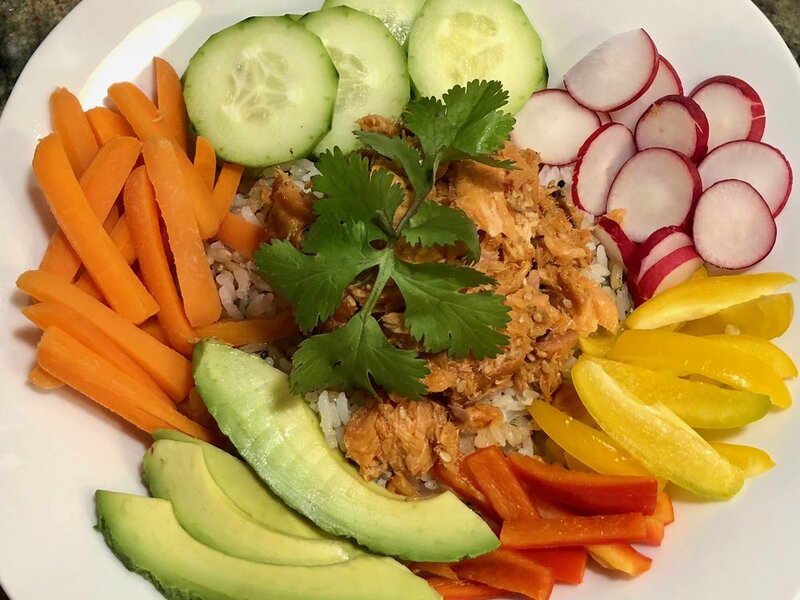 Surround or top rice and salmon with thinly sliced cucumber, radishes, bell pepper, julienned carrots, and avocado. Sprinkle fresh cilantro. Serve immediately. While living in Singapore, we discovered every cuisine is represented there. My husband and I often visited a quaint Italian restaurant for date night not far from our apartment. They had a pasta dish I really liked, but when I moved to St. George, Utah I could not find anything comparable. So I contacted the restaurant through the internet and asked for a list of ingredients for the dish and came up with my own version called Veggie & Herb Pasta. Buon Appetito! Heat the oil in a large skillet. Sauté the garlic and chili for 30 seconds to release the flavor. Add onion and sauté until, transparent. Reduce heat to low. Add tomatoes, bell peppers, and olives. Stir and warm through. Add Spinach leaves and fold in. Stir until they are a bright green color and wilted. Stir in prepared noodles, basil, and cilantro and squash. Add seasoning, salt and pepper to taste. This is the perfect recipe to use up some of your Thanksgiving leftovers! Preheat oven to 350 degrees. Line a baking sheet with aluminum foil. Toss the sweet potatoes with the avocado oil—season lightly with salt and pepper. Place the sweet potatoes on the baking sheet lined with foil. Bake for 25 minutes, or until the potatoes begin to brown on the outside and are tender when pierced with a fork. Allow potatoes to cool and then combine with remaining salad ingredients except the greens. In a food processor, combine the vinegar, mustard, honey, salt and pepper. Process until smooth. With the machine running, slowly add the olive oil in a thin, steady stream until the vinaigrette is thick and emulsified. Add sage and the poultry seasoning. 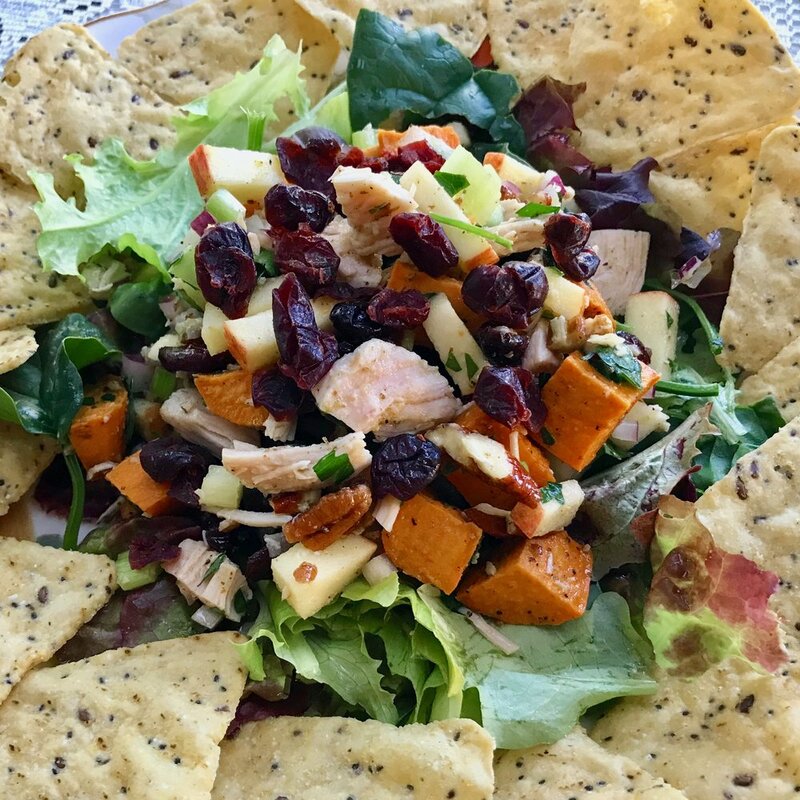 Place salad greens on plate, top with turkey salad mixture, and drizzle with vinaigrette. Serve with tortilla chips on the side. 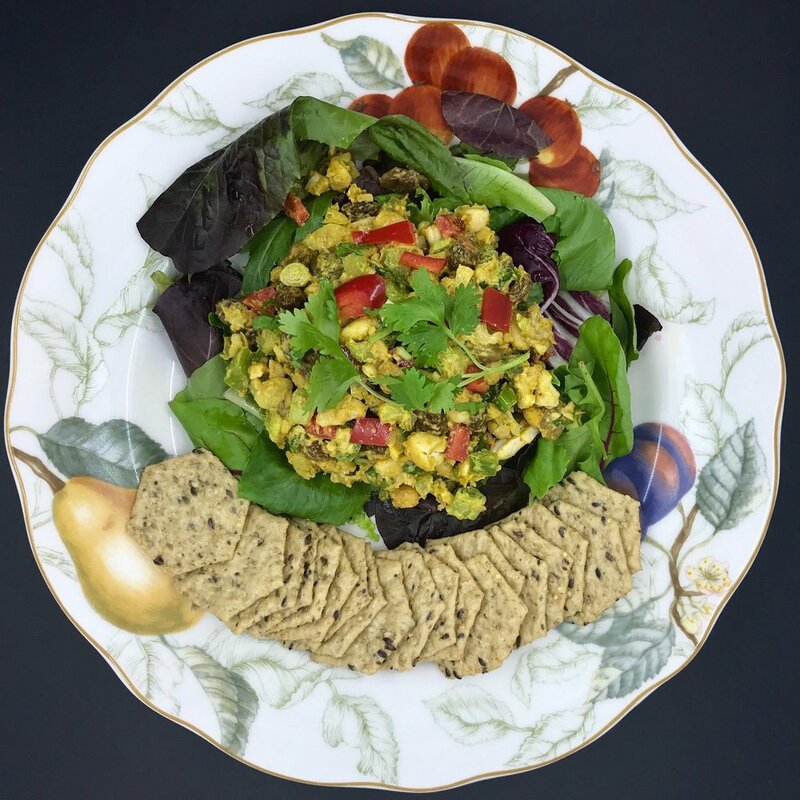 Because I have been dealing with menopausal symptoms the past few years, I have incorporated more vegan recipes into our diet. My thought process is since my own hormones are continually fluctuating, the addition of hormones from animal products would only add to the problem. Here is a favorite recipe we often eat for lunch. In a medium mixing bowl, add chickpeas and roughly mash with a potato masher. Add in the peppers, onions, celery, raisins, cashews, and curry powder. Mix well to combine. In a small bowl, combine tahini with the mayo, lemon juice, chili sauce, garlic, a pinch of salt, and water until desired consistency. Taste for flavor, adding salt and cracked pepper if needed. Serve on a bed of leafy greens with crackers or use as a sandwich spread, or in a wrap. Blend all ingredients except strawberries in your BlendTec or Vitamix until smooth. Add strawberries and blend till smooth. Pour into quart jar for 1 serving or into pint jars for 2 servings and enjoy! Makes a 400-450 calories perfect pink.